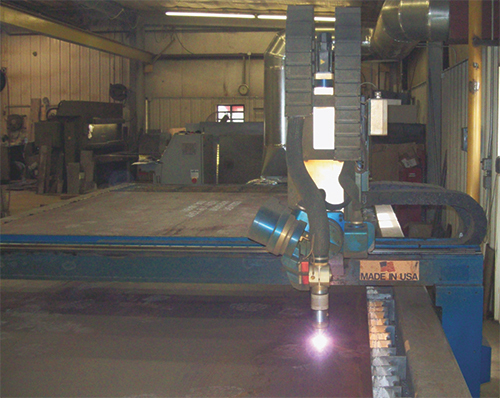 The Schramm 30,000-sq.-ft. metalforming and weld shop installed, in June 2010, this 20- by 40-ft. CNC plasma-cutting machine. The machine is outfitted with Hypertherm state-of-the-art PAC equipment that includes True Bevel and True Hole technology, which automatically adjusts several parameters to optimize edge finish and hole circularity based on material type and thickness and hole diameter. Who made these statements? David Kerstetter, a manufacturing engineer at Schramm, Inc., an OEM manufacturer of hydraulic drill rigs; and Curt Renaud, founder and owner of Curtis Welding, a custom fabrication and welding shop. The Schramm drill-rig production facility in West Chester, PA, serves the 113-yr.-old company well, as it recently received the 2013 Governor’s Impact Award for Exporting. From 2010 through 2012, Schramm tripled export revenues, opening new markets in three continents. It also received the Manufacturer of the Year Award for 2012 from the Greater Philadelphia Chamber of Commerce. 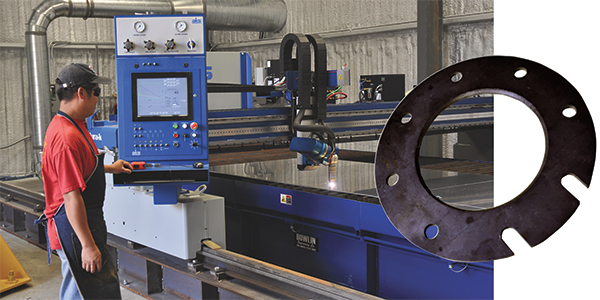 All of that comes not long after the company’s 30,000-sq.-ft. metalforming and weld shop installed, in June 2010, a new 20- by 40-ft. CNC plasma-cutting machine. The accu-kut machine, from Advanced Kiffer Industries, Cleveland, OH, is outfitted with Hypertherm (Hanover, NH) state-of-the-art 400-A PAC equipment. While no one directly relates the new PAC machine to the company’s award-winning prowess, its benefits are obvious to Kerstetter. Schramm’s PAC machine replaced shearing and oxyfuel cutting for profile cutting, and use of an ironworker to punch holes. As a result, productivity and throughput have soared. Kerstetter offers an example. In addition, some 50 percent of the plasma-cutting work completed on the accu-kut features a beveled edge for weld prep. Here’s where Kerstetter’s homework on PAC technology has really paid off, by opting to include Hypertherm’s True Bevel technology. True Bevel automates cutter-path and parameter programming (such as gas type and pressure) based on the desired bevel profile. It reduces or eliminates trial-and-error time, increasing productivity and minimizing waste. This 8.5- by 25-.ft. PAC machine landed on the Curtis Welding shop floor in March 2012, after owner Curt Renaud researched the technology at the Fabtech 2011 tradeshow in Chicago. It allows the shop to work with 8- by 20-ft. plates and avoid weld-splicing smaller sections, saving hundreds of hours of production time while improving accuracy. Curt Renaud, namesake of Curtis Welding, Atlantic, IA, begins our discussion by echoing Kerstetter’s comments related to etching with his new accu-kut/Hypertherm PAC setup. “I couldn’t imagine buying a plasma machine without the ability to etch,” says Renaud. Renaud’s fab-and-weld shop employs 10, having more than doubled in size since 2004. He’s expanded the shop several times in recent years, to keep up with increased demand from large customers in the wastewater, precast concrete and wind-tower industries. That’s quite an impressive customer list compared to the local repair gigs he cut his teeth on when he launched the firm in 1990, in a 50- by 50-ft. rented building. Today, Curtis Welding calls a 13,500-sq.-ft. shop home, outfitted with a 250-ton 14-ft. press brake, 120-ton ironworker, a vertical saw, 7.5-ton overhead crane, a bevy of welding equipment and its new 8.5- by 25-ft. accu-kut/Hypertherm PAC machine. Renaud, like Kerstetter, appreciates the Hypertherm True Bevel and True Hole technology—“Our customers, particularly those in the wastewater industry, love the hole quality we produce,” he says. And, he boasts of now being able to work with 8- by 20-ft. plates and avoid weld-splicing smaller sections. “We’ve eliminated beveling as a secondary process—either manually or automated. And we’re saving hundreds of hours of production time while improving accuracy, so that fitup and welding in the field becomes easier for our customers,” Renaud adds. Comparing his new PAC setup to the previous version, Renaud also notes the dramatically decreased piercing time—from 2 sec. per pierce on average before to as little as a few milliseconds now. And plenty of his work requires a considerable amount of piercing. What about etching? Here, Renaud tunes down amperage to the machine’s 260-A cutting head to 10 A, and etches bend lines onto plate sections to ease downstream operations.